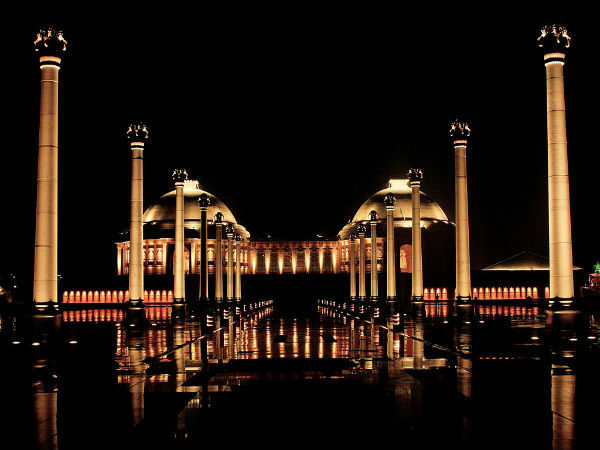 The Ambedkar Memorial Park is a public park and memorial which is built across 107 acres in Gomti Nagar, Lucknow. The park was formally known as Dr. Bhimrao Ambedkar Samajik Parivartan Prateek Sthal. The park was constructed in memory of social reformers like Jyotiba Phule, Sree Narayana Guru, Birsa Munda, Shahuji Maharaj, Bhimrao Ambedkar, Kanshi Ram and others who had devoted their lives for humanity, equality and social justice. The memorial was constructed and opened to the public in the year 2008. The memorial is the brainchild of Mayawati, who was the then Chief Minister of Uttar Pradesh and led the Bahujan Samaj Party. The entire monument is constructed using red sandstone brought in from Rajasthan; the entire cost of the monument is said to be 7 billion INR. The place has several structures which add on to the beauty of the park, which is considered as a major landmark in the city of Lucknow as well as a matter of pride. The monument is open throughout the year to visitors. However, Lucknow is a place where the summers are harsh and dry due to which many people prefer not to visit the place. It also experiences heavy rainfall; the winters are rather pleasant which makes it the best time to visit the place. The Ambedkar Stupa is one of the major attractions inside the park. The stupa is constructed at the heart of the park. The sanctum sanctorum hosts many statues of Ambedkar which depict his biography. The stupa has four entrances, in all the four directions; the structure is built on the lines of a flower with four petals. One can find a statue of Ambedkar in a seated position facing the dome and sports an inscription at its base which reads as, "My struggle of life is my only message". The next noteable structure here is the Dr. Bhimrao Ambedkar Samajik Parivartan Sangrahalay, which is constructed across an area of 2.5 acres. The structure has two domes atop it, and houses large statues of Jyotiba Phule, Shahuji Maharaj, Sree Narayana Guru, Dr. B.R. Ambedkar and Kanshiram. Another structure hosts 18 ft tall marble statues of Gautam Buddha, Kabir Das, Sant Ravidas, Guru Ghasidas and Birsa Munda. There is also a gallery which is built across 4 acres of land which has murals made out of bronze. Pratibimb Sthal is the main entrance of the memorial which has 62 huge statues of elephants on either sides of the path guarding the monument. The elephant statues are a major draw here; a word of caution though, if you touch the statues, you will be imposed a fine of INR 500. The next structure is an 80 ft tall pyramid structure which is named as Dr. Bhimrao Ambedkar Memorial Drashya Sthal. The Drashya Sthal offers a vantage point from where one can see the park, the shrines and the structures. The pyramid structure has water flowing from its top, which draws a large number of visitors. The memorial collects an entry fee of INR 10 from its visitors. The park is open throughout the year from 11:00 AM to 9:00 PM. It is advisable to visit the memorial after sunset as the place gets lit up and is a beautiful sight to see.